Floral tattoos are always popular when it comes to permanent ink art. A large part of the charm lies in the vivid colors, shapes and patterns of flowers. It does not always have to be huge flowers, even tiny clusters or a small single flower can look graceful. Small Flower Tattoos celebrate the idea that small is beautiful. When it comes to placement, the foot is often a great choice for a tattoo. The small area of the foot with its curves, is ideal for inking tiny flowers. Brightly colored flowers in a small cluster inked on one foot, look elegant and feminine. Within the small petals, there can be delicate shading and remarkable artistry. The deft outlines bring out the beauty of individual petals, while the green leaves are done in delicate detail to complete the design. Flowers and butterflies often make a great combination in tattoos, and the effect is prettier when you have tiny flowers with large butterflies nearby. Small flowers are often inked on the upper back, the upper chest, or a private area like the side of the stomach. 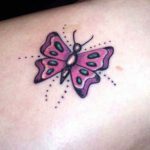 Sensuous and vibrant, small flowers have a special place in the world of tattoo art.Here are our 20 Small Flower Tattoos Ideas and Designs.Enjoy and get inspired!! !